Financial Freedom Update (Q4) – December 2018 – Did we Reach our Goal? Welcome to the Million Dollar Journey December 2018 Financial Freedom Update – the final update for 2018! If you would like to follow my latest financial journey, you can get my updates sent directly to your email, via Twitter or Facebook, and/or you can sign up for the monthly Million Dollar Journey Newsletter. Our current annual recurring expenses are in the $52-$54k range, but that’s without vacation costs. However, while travel is important to us, it is something that we consider discretionary (and frankly, a luxury). If money ever becomes tight, we could cut vacation for the year. In light of this, our ultimate goal for passive income to be have enough to cover recurring expenses, and for business (or other active) income to cover luxuries such as travel, savings for a new/used car, and simply extra cash flow. Major Financial Goal: To generate $60,000/year in passive income by end of year 2020 (age 41). Reaching this goal would mean that my family (2 adults and 2 children) could live comfortably without relying on full time salaries (we are currently an one income family). At that point, I would have the choice to leave full time work and allow me to focus my efforts on other interests, hobbies, and entrepeneurial pursuits. In the last update, we showed solid progress in reaching $43,450 in annual dividend income. 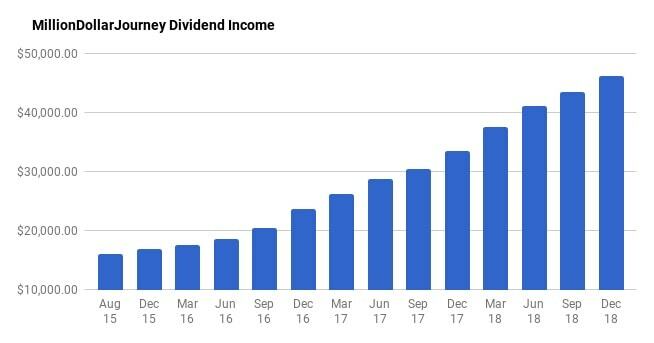 Starting the year at $33.4k/year in dividends, there was quite an increase over 2018 due to taking advantage of the market volatility. With all this recession talk and political instability with the biggest economy in the world, the volatility will likely continue well into 2019. Here are the numbers in my previous financial freedom update. This past quarter was relatively uneventful except for a long overdue market correction. 2018 thus far has been tough for investors as market volatility has taken over. Broad indexes in Canada, the US, and internationally are showing negative returns this year. For long-term investors, don’t sweat it! Market corrections are a little gift that allows you to continue accumulating assets at lower prices. These events are par for the course and don’t happen as often as you think. As the recession talk is building, the downward momentum is building with it. No worries though, buyers will come back eventually (likely soon), but in the meantime, keep your eyes open for buying opportunities. Let’s talk a bit about my passive income strategy – generating dividend income. As dividends are the main focus of my passive income pursuit, there is a large dependence on the market. While there are merits to this investment strategy, there are also substantial risks – particularly dividend cuts. Fortunately, there haven’t been any recent cuts. The goal of the dividend growth strategy is to pick strong companies with a long track record of dividend increases. In terms of dividend increases, 2018 has already proven to be a successful year for dividend growth seekers. Riocan (REI.UN); Telus (T); Canadian Utilities (CU); Canadian National Railway (CNR); Kimberly Clark (US: KMB); Metro (MRU); Chevron (US: CVX); Exco Technologies (XTC); Manulife (MFC); Suncor (SU); Bell Canada (BCE); Great-West Life (GWO); Brookfield Infrastructure Partners (BIP.UN); Coca Cola (US: KO); AbbVie Inc (ABBV); TransCanada Corp (TRP); Walmart (US: WMT); Magna (MG); CIBC (CM); Scotiabank (BNS); Bank of Montreal (BMO); TD Bank (TD); Husky Energy (HSE); Canadian Western Bank (CWB); AT&T (US:T); Visa (US: V); Abbot Labs (US: ABT); Wells Fargo (US: WFC); Power Financial (PWF); Transcontinental (TCL.A); Procter & Gamble (PG); Unilever (UL); Exxon (XOM); Johnson and Johnson (JNJ); Loblaws (L); Canadian Pacific Railway (CP); Sunlife (SLF); Apple (AAPL); Caterpillar (CAT); Target (TGT); Empire (EMP.A); Emera (EMA); Royal Bank (RY); Verizon (VZ); McDonalds (MCD); Fortis (FTS); Nutrien (NTR); and George Weston Ltd (WN). In addition to the dividend raises, I’ve continued to deploy cash into dividend stocks. In the past quarter, it was mostly in my corporate account. In previous updates, it has mostly been a non-registered account (for my spouse) that was created in 2017 (opened the account with MDJ reader favorite Questrade). There was some cash savings in her account that needed to be deployed, and I was able to get it invested in short order. As one of the goals of this particular account is to generate a high and reliable yield (spouse is in lower tax bracket), I am experimenting with the Dogs of the TSX strategy. While 2018 was not kind to dividend stocks, I will continue to buy them when their valuation is attractive. I will report on market returns and how the dogs of the TSX have performed in a future post. iShares MSCI All Country World ex-Canada (XAW) – With my RRSP contribution room growing going forward due to my new career (no more defined benefit pension), XAW will grow and likely be my largest position in the next couple of years. As you can see in detail below, over the last quarter we have increased our dividend income from $43.5k to $46.1k which represents a 6.10% increase quarter over quarter and 76.8% of my goal ($60k). Bank of Nova Scotia (BNS). Even though my portfolio value is down significantly quarter over quarter, my dividends continue to grow! Through a combination of deploying cash, continuing to add to positions with savings, and collecting those juicy dividend increases, this quarter has been fairly productive with a 6.10% bump in dividend income. This has resulted in exceeding my dividend goal of $45,000 in 2018! Not only do I enjoy watching the dividends flow into the account, I’m also a big believer in compounding returns (see how compounding can make you rich). In other words, the dividend cash is deployed into more income-producing stocks which then further increases the income of the portfolio, which is then used to buy even more stock. See how compounding works? It’s only a matter of time before the snowball gains momentum and develops a mind of its own. I welcome corrections/volatility as it gives investors in the accumulation phase a chance to buy quality companies (or index ETFs) at better prices, potentially increasing long-term returns. If you are also interested in the dividend growth strategy, here is a recent post on how to build a dividend portfolio. With this list, you’ll get a general idea of the names that I’ve been adding to my portfolios. If you want a simpler investing strategy that outperforms most mutual funds out there, check out my top ways to index a portfolio. There you have it, the last financial freedom update for 2018. It has been a successful year as we managed to slightly exceed our dividend income goal of $45,000. With a couple years left, it feels like the $60k/year goal is within reach and only a matter of time before it is conquered. I have some new ideas to grow my passive income through a new means – keep an eye out for that post in 2019. MDJ: I really appreciate that you share the details of your investments, dividends etc. and I was wondering if you have a page or chart that shows the amount invested (excluding interest and dividends) by year – I haven’t been able to find it if you have. It would really show how it’s done. Hi Bob! Happy Holidays! I haven’t been tracking the amount invested by year, although the information is available as I have all my trades sent to my email. Something to think about for a future post. Thanks for the idea! Fascinating update! I really appreciate all of the hard work that you’ve put into the blog. I just started following it and it looks like I have many, many articles to catch up on! Do you have any advice for high school students like me who want to become financially free relatively early in their lifespan? Because I’m not yet 18, I’m restricted in the things I can do so I was just wondering if you had any tips for the future. Thanks! Follow up with any questions that you may have – the community here is happy to help. do you have info on buying gic’s through Questrade ? Hi J, I haven’t purchased any GICs from Questrade before, but I will take a look. Congrats on a great dividend income update to finish off 2018! I am reading The Ultimate Dividend Playbook right now and my love affair for dividends is even more fired up haha! They are just so amazing, seriously. Happy new year gym, I will check out that book as well. Let’s assume you have reached your goal and quit your job, living on your dividend streams only. How would you approach this? Would you just harvest the dividend from all the accounts? Or? I wonder if there is a optimal way of thinking about it considering taxes, the decisions you have to make as you get to 60 yrs old (CPP, AOS, …), and associated potential clawbacks. Excellent question Pierre! I would use the dividends from the corporate account first, then non-registered. If side-income (I’ll always do something) isn’t enough at that point, then I’ll dip into TFSA and RRSP distributions. Providing that income is split properly, OAS clawback should not be an issue (clawback starts @ ~$75k income each), but I imagine that CPP will not be that large (spouse has not had a salary in a number of years). Congrats. It’s amazing to see! What’s your breakdown between US and CAD stocks? Are you staying away from US stocks with the exchange rate? Thanks for the kind feedback! My personal breakdown is about 40/60 Canada/Rest of the world. Including the corp, however, it’s a different story as it’s mostly Canadian dividend stocks. Everyone is on their own path ! Congrats on your progress ! wow that is quite the year ft! Loving seeing all that growth and your dreams/goals become reality. Its great that you share your top 10 holdings. curious why trp instead of enbridge and why td is not on the list. haha. You are just killing it and its great to see. Thanks for the kind feedback. We do hold enb but it’s highly volatile and moves quite a bit on the list . With regards to td, with the recent dip, I’ve been adding and may be top 10 soon enough . That’s a great looking chart! Congrats on the progress. I have a goal of generating $250,000 in passive income by 2022, and preferably $300,000 by then as private school from kindergarten starts at around $33,000 a year and only goes up! Holy crap it’s expensive to live in SF or Hawaii. 250k?? Obviously I’m not thinking big enough ! Congrats on the huge progress. I went to Rob Smith son of Author of the Smith Maneuver 10 years ago. I collapsed the Maneuver after 10 years. Rob Smith used return of capital funds that paid out less and less each year and value never recovered years after the crash of 2008. The result is a mortgage much larger than what I started with and no investments towards my retirement. Had I not gone to him my mortgage would be 50% paid off by now. Instead I’m in worse shape then when I started. Stay away from Rob Smith. Are you only holding XAW within your RRSP? Any reason for that if so? Just seeing this Andrew, in my wife’s RRSP, it’s basically XAW. I’m also building up XAW in my personal tax-sheltered accounts. Next post: The Best of Million Dollar Journey – 2018 Edition!